Why not spend a weekend dedicated to spring skiing in the Ain region in the middle of the Jura Mountains? You will have to climb to the highest peaks of course to find the last snows while enjoying a nice stay not far from our Swiss friends! 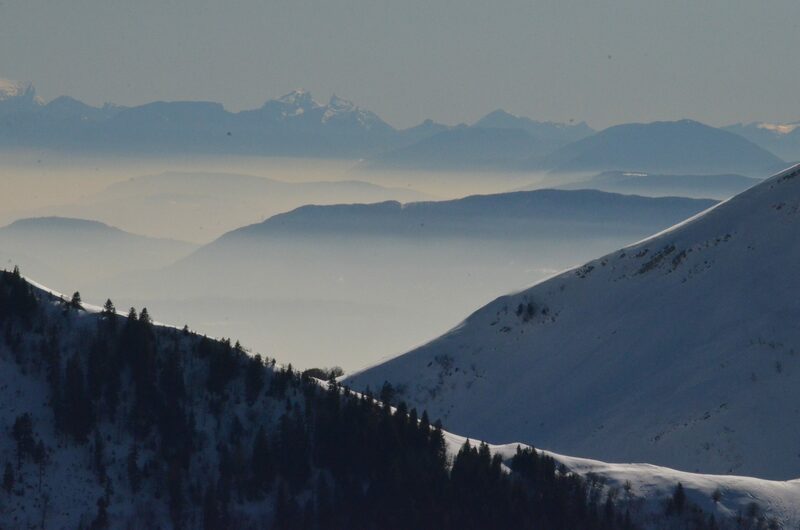 The Ain region is one of the three districts forming the Jura mountains with the Doubs and the Jura. The department has the highest summits of the massif with the Crêt de la neige (1720m) and the Reculet (1717 m). 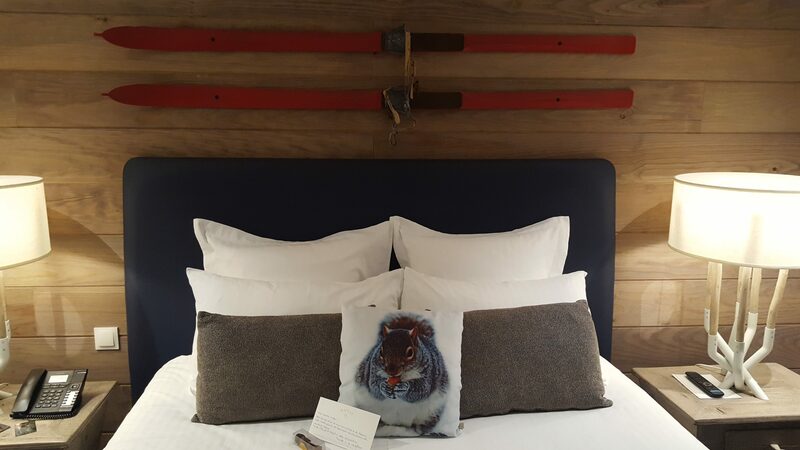 Whether you are cross-country skiers, alpine skiers or snowshoe enthusiasts, there’s always something to do for everyone! A breathtaking view on the Mont Blanc, Lake Geneva and the Jura mountains (labeled in the 2000s’) will be the icing on the cake of photographers. Ask for the program, the Ain will offer you an anthology of courses for all tastes! From the 12th century, the monks were at the origin of clearing within the Valley of the Valserine. They were at the initiative of the alpine pasture system and the famous cheese making in the Jura mountains . 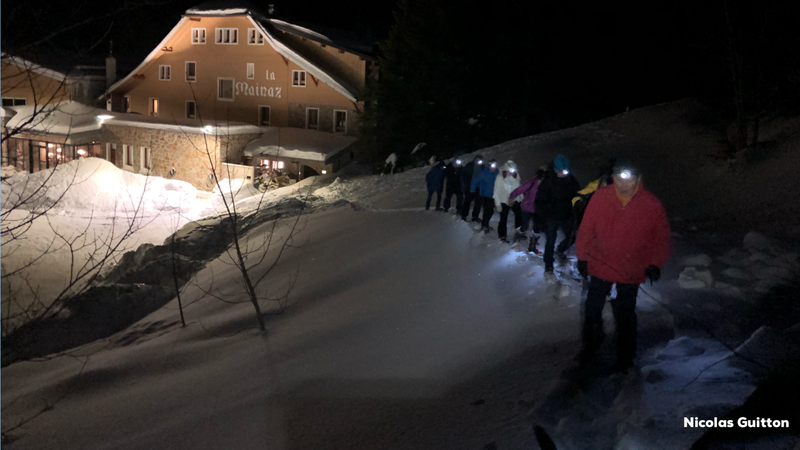 Our night snowshoeing lasted about an hour and was guided by Nicolas, it appealed to all our endurance, a good preparation for the GTJ ( Great crossing of the Jura)! Harnessed by a headlamp lighting timidly our steps in comparison with the rising moon, the group slowly progressed in the spruce forest. We skirted protected areas called “quiet areas” for flora and breeding of local wildlife. Spring being officially declared since a few days, you should be able to hear the guttural cries of the capercaillie, impressive and rare gallinaceous, at the height of courtship! The route we pursued is located between the Col de la Faucille and the Grand Monrond, we crossed the village of Mijoux at 1000 meters altitude. This resort has a very old tradition of hospitality and was for a long time a stage for pilgrims going to pay a tribute to the tomb of Saint -Claude. Mijoux was equipped with its first ski lift in the 1930s. After an hour, our efforts were rewarded near a small chalet where windows were lit by candlelight. We pushed the door and found ourselves in an atmosphere worthy of Goldilocks’ story! Two cheese dips of blue Gex and Comté were simmering close to the large wooden table where our guide invites us to sit. The mac wine flowed freely and warmed us up nicely and everyone got hunting for a crouton wrecked in the cheese dips … Delicious moment of sharing ! 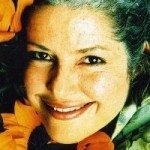 The dinner was finally crowned with a blueberry pie with a spruce liqueur! The easy- going simplicity of this meal turned out to be a real moment of authenticity. But the rest of the story did not make us sleep in a small, medium or giant bed ! What better comfort than the one of a four-star hotel that was completely renovated in 2016 ? 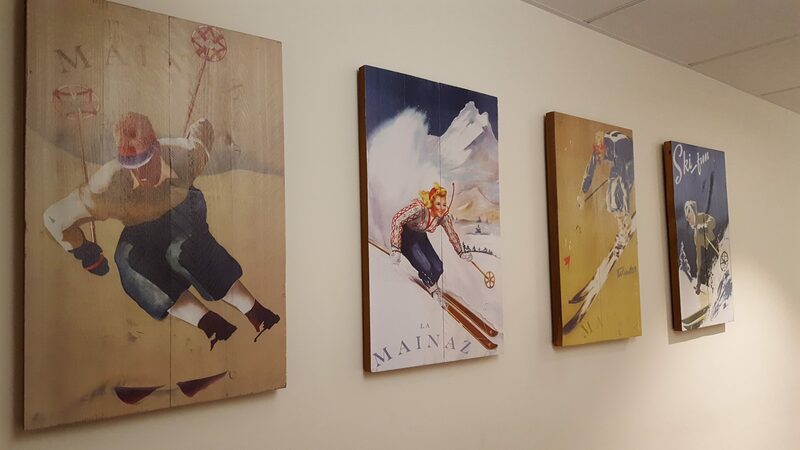 La Mainaz, a silent relay spot, offers an elegant powder-coated beige décor and retro ski posters. My very cozy room opened on a dream landscape in order to contemplate relentlessly summer as winter! 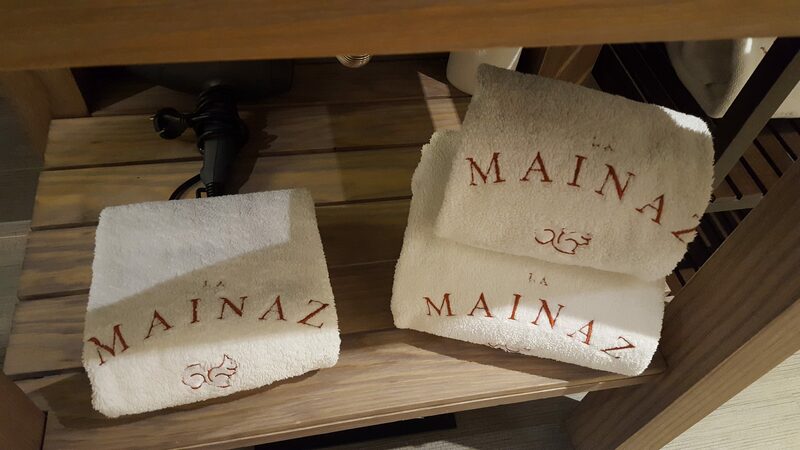 The restaurant of the hotel La Mainaz offers various menus discovery ranging from 90 to 70 euros. We will particularly remember the back of flaming stag with the Capuchin matched with crunchy chestnuts or the Saint-Pierre fish with truffle, topped with Jerusalem artichokes and roasted hazelnuts. 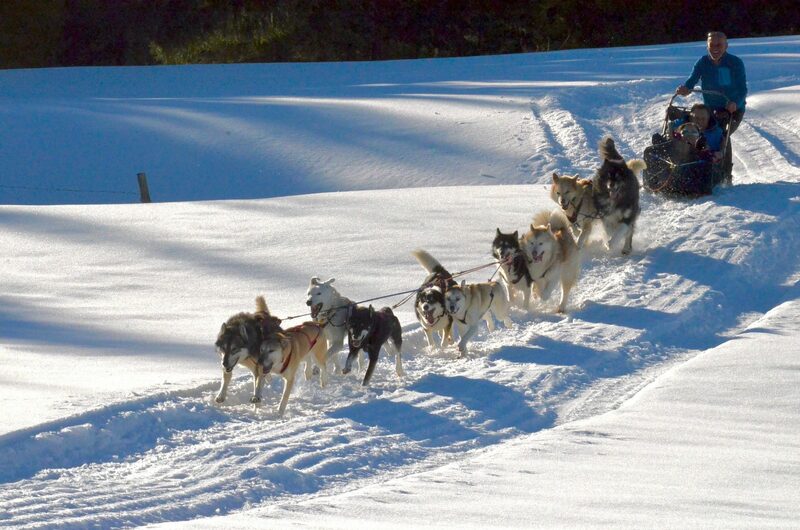 Located north-east of the Ain, the plateau du Retord offers more than 20 kilometers of walks in dog sledges in winter and cani-hikes during summer. Huskies, Australian shepherds and Alaskan Malamutes are gathered here.Therefore the mushers need to respect a very precise hierarchy in the way of harnessing their dogs. 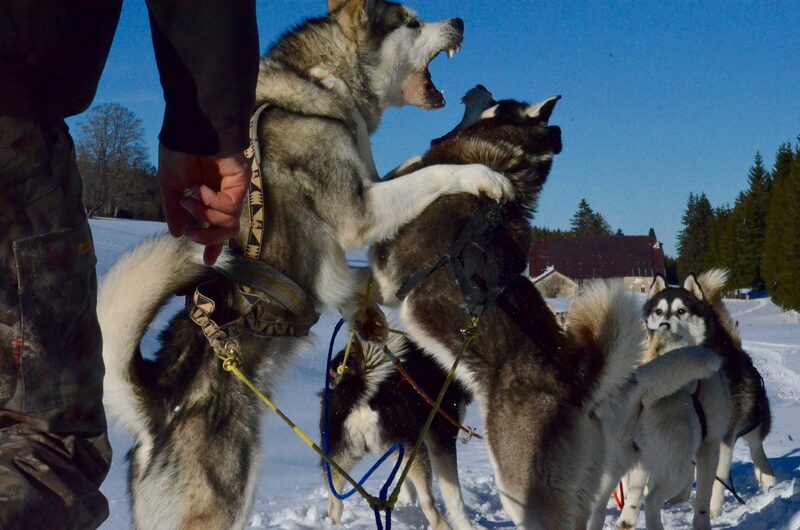 They must sometimes show a great cold blood to thwart the fights between dominant and other members of their pack that is very responsive to their voice ! After a tour through the surrounding woods, we sat down at the Auberge de la chapelle du Retord to taste a chicken with yellow wine, cream and morels accompanied by a gratin dauphinois ! Friendly address will participate in the conviviality of the reception of the Brothers Bouvard. 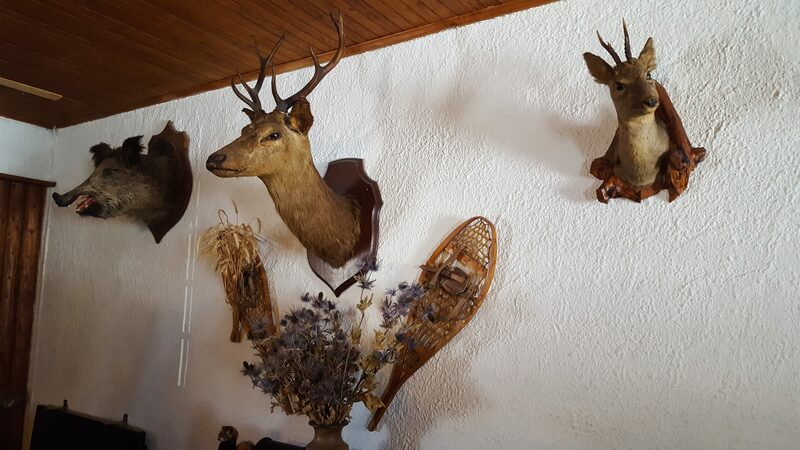 A large fireplace and hunting trophies decorate this traditional inn. Aufildeslieux recommends you to leave with a 1 kg honey jar sold on site by the Combe du Val honey farm. A breathtaking panoramic view at the top of the Mont-Rond. You will have to reach 1500 meters height to access the summit of Mont-Rond by chairlift and gondola. 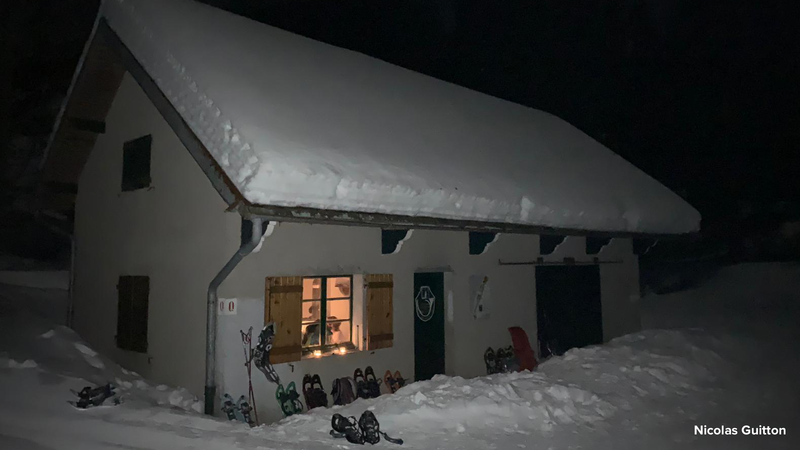 All upstairs one will enjoy various hiking trails and snowshoeing in the Regional Natural Park of Haut-Jura. On the terrace of the Grand Tétras restaurant you never tire of admiring the Jura Mountains. 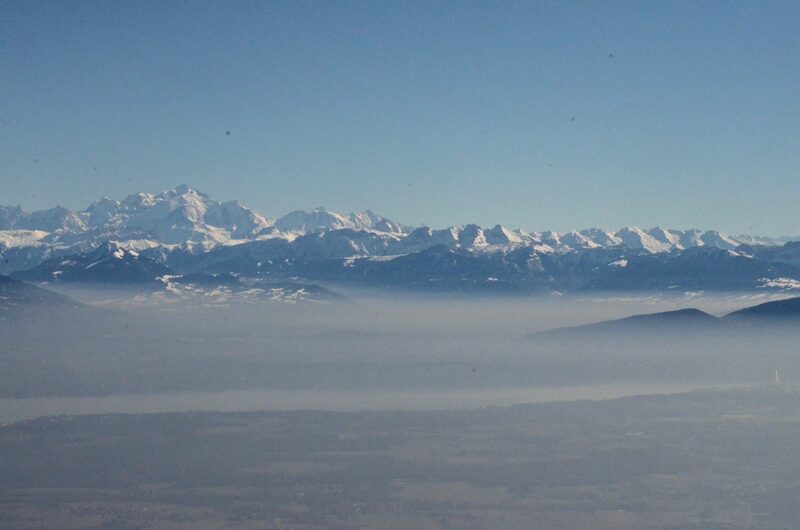 This territory is more than 5 million years old, as well as the Alps and the Mont-Blanc.